Ironically, the lovable and selfless Shmoos ultimately brought misery to humankind because people with a limitless supply of self-sacrificing Shmoos stopped working and society broke down. Seen at first as a boon to humankind, they were ultimately hunted down and exterminated to preserve the status quo. (Thought extinct after the 1948 adventure, one Shmoo always seemed to escape to Dogpatch’s Valley of the Shmoon to form a new colony and a later plot revival by Capp). Licensed Shmoo merchandise became a huge phenomenon in the late ’40s and early ’50s, spawning a wide variety of dolls, toys, glasses, wallpaper, belts, books, jewelry, balloons, clocks, ashtrays, cannisters, salt & pepper shakers, dairy products, banks, belts and ear muffs. There was even an official Shmoo fishing lure! These are all highly collectible items today. 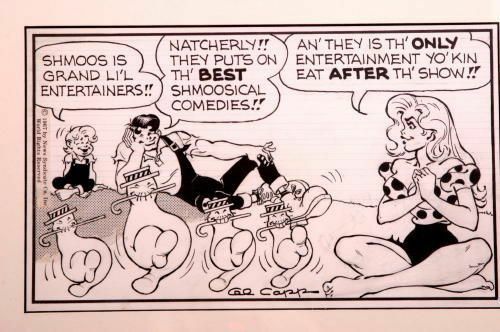 Sadie Hawkins Day, an American folk event, made its debut in Al Capp’s Li’l Abner strip November 15, 1937. Sadie Hawkins was “the homeliest gal in the hills” who grew tired of waiting for the fellows to come a courtin’. Her father, Hekzebiah Hawkins, a prominent resident of Dogpatch, was even more worried about Sadie living at home for the rest of his life, so he decreed the first annual Sadie Hawkins Day, a foot race in which the unmarried gals pursued the town’s bachelors, with matrimony the consequence. By the late 1930’s the event had swept the nation and had a life of its own. Life magazine reported over 200 colleges holding Sadie Hawkins Day events in 1939, only two years after its inception. It became a woman empowering rite at high schools and college campuses, long before the modern feminist movement gained prominence. The basis of Sadie Hawkins Day is that women and girls take the initiative in inviting the man or boy of their choice out on a date, typically to a dance attended by other bachelors and their aggressive dates. When Al Capp created the event, it was not his intention to have the event occur annually on a specific date because it inhibited his freewheeling plotting. However, due to its enormous popularity and the numerous fan letters Capp received, the event became an annual event in the strip during the month of November, lasting four decades. Pint-size Lucifer “Pappy” Yokum had the misfortune of being the patriarch in a family completely dominated by his better half, “Mammy” Yokum. On the other hand, Pappy didn’t seem to complain. He had a free ride for many years. Mammy did all the household work. Ostensibly a turnip farmer, Pappy was rarely seen working. In fact, he was so lazy, he didn’t even bathe himself. Mammy was regularly seen lathering and scrubbing Pappy in an oak tub next to the modest Yokum cabin. Mammy was the unofficial mayor of Dogpatch and could read. Pappy was illiterate. Mammy was smart. Pappy was dull-witted and gullible. Though their unlikely offspring Li’l Abner was at least twice his father’s (and mother’s) size, Abner obviously inherited a good many of his father’s lesser traits. Mammy, born Pansy Hunks, was the pint-sized, highly principalled, cornpipe smoking leader of the Yokum clan. Her lethal right undercut, sometimes called the “good night Irene punch” helped her uphold law, order and decency. She seemed the toughest character and kept up the integrity of the strip. Her mantra was “good is better than evil because it’s nicer”. Beautiful Daisy Mae Scragg was hopelessly in love with Li’l Abner through the entire course of the 43 year run of Al Capp’s comic strip. During most of it Abner took Daisy for granted and exhibited little romantic interest in her voluptuous charms. In 1952 Abner reluctantly proposed to Daisy Mae to emulate the wedding of his comic strip ideel, Fearless Fosdick. Fosdick’s wedding turned out to be fake, but Abner and Daisy’s was real. Once married, Abner became relatively domesticated and the two produced their only child, Honest Abe, in 1953. Like Abner’s Mammy Yokum and other wimmenfolk in Dogpatch, Daisy Mae did all the work while the menfolk generally did nothing whatsoever. Despite this near slavish role, Daisy Mae seldom complained, one of her countless virtues. Her blood family, on the other hand, was as evil as could be. Wild plot twists often took Daisy Mae to exotic locales and she was frequently wooed by rich and handsome men, but she always returned to Dogpatch and her true, if worthless, love. Li’l Abner was the title character in the long-running (1934-1977) syndicated newspaper strip by cartoonist Al Capp. Hardly “li’l,” Abner was a hulking, naive man-child, and the frequent foil for Capp’s satiric stories about American life and politics. This simple-minded citizen of humble Dogpatch was a paragon of virtue in a dark and cynical world. Abner often found himself far from home, whether in the company of unscrupulous industrialist General Bullmoose, in hapless snowbound Lower Slobbovia, or wherever Capp’s whimsical and often complex plots led our heroic hillbilly. Li’l Abner was the unlikely son of tiny Mammy (Pansy) and Pappy (Lucifer) Yokum. Mammy was the industrious “sassiety leader” of backward Dogpatch who instilled honesty and All-American ideals in Li’l Abner. Pappy, in contrast, was an illiterate and hopeless parasite. From the inception of the strip, Abner was vigorously pursued by Daisy Mae, a beautiful Dogpatch damsel hopelessly in love with the bumbling, unappreciative and seldom amorous bachelor. Abner spent nearly two decades outracing Daisy in the annual Sadie Hawkins Day race but the couple finally married in 1952, a fictional event that captured national attention and was a cover story for Life magazine. Their only child, Honest Abe, was born in 1953. Li’l Abner generally had no visible means of support but he sometimes earned his living as a mattress tester. When not involved in worldwide escapades, he was engrossed by his favorite “comical strip,” Fearless Fosdick. He interacted with many marvelous and fantastic characters creating language and situations which have become permanent parts of the American lexicon.